When Fatuma Ali Sali talks, the words come out as if they are spilling down a waterfall. It’s hard to keep up. With a mischievous smile, she acknowledges she’s talking too much, not leaving time for anyone to ask questions. Fatuma is one of nearly half a million people participating in a Catholic Relief Services project on resiliency and adaptation. The 3-year project will help people use new practices and technologies to mitigate the devastating effects of hotter temperatures, prolonged droughts and soil erosion. 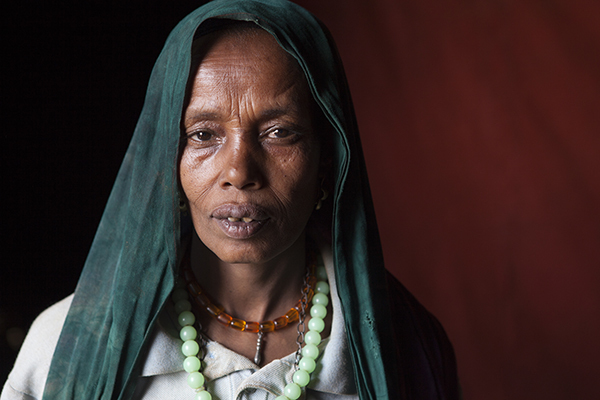 A mother of eight living in a remote area of Ethiopia’s eastern Oromia Region, Fatuma sits on one of the small rocks in her one-room mud house. An occasional bleat comes from three small goats and a young calf, chained to the wall next to her. Livestock is one of the most valuable assets a family can have here, so sharing her small home with them is like parking a car in a garage. At the time, her family’s only income came from selling crops at the local market. Without a harvest to sell, her husband found work plowing their neighbor’s fields—all by hand, because he had no ox. Their only animal was a donkey barely strong enough to carry water. “Not a good year” is putting it mildly. Ethiopia is suffering through the worst drought in 50 years. Millions of people live on the brink of disaster as a strong El Nino current intensified the latest of the country’s recurring droughts. Climate change has caused longer, more severe dry periods. If another harvest fails, up to 20 million people could face life-threatening food shortages unless they receive immediate aid. Improving their families’ financial health through saving groups, using loans to start small businesses. Rehabilitating their environment through natural resource management, like building hillside terraces to prevent erosion or diverting streams to improve irrigation. Improving their health and nutrition. Using early warning mechanisms to communicate weather forecasts so farmers can adapt and better plan their activities. Since early 2015, CRS has helped thousands of people—from farmers to animal herders—become more resilient by adapting through new behaviors, approaches and technologies. 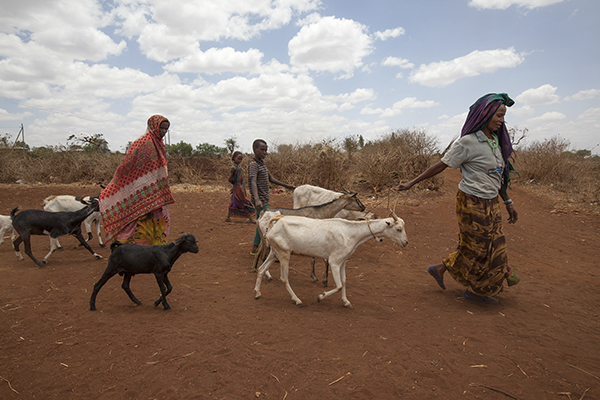 The El Nino crisis means changes are only incremental, but they are a beginning. “There’s been an improvement,” says Fatuma, with a nod to the animals she was able to buy with a loan from her savings group. Joining the group has given her financial independence, a life-changing form of resilience. She’s also had a small harvest thanks to drought-resistant seeds and training on how to cultivate vegetables. Instead, she can sit in her house and hear the reassuring sounds of her goats and calf.